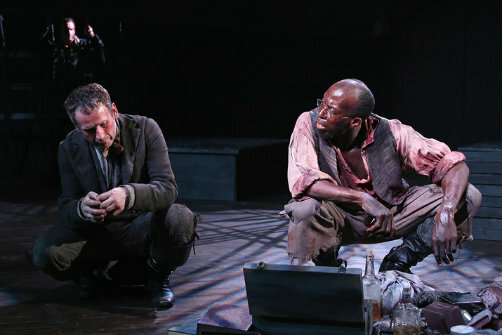 Brian J. Carter, Brian Barnhart and Julian Rozzell in The Vast Machine. Photo by Dixie Sheridan. BOTTOM LINE: Five 19th-century sailors are just barely keeping it together aboard a ship full of contraband slaves. The Vast Machine looks at the American slave trade from a point of view audiences may not have seen before: set on the dock of a ship whose hull is filled with human cargo, its focus is on the crew charged with transporting these kidnapped Africans to Western ports. These men wrestle with conflicts both practical and moral in a tense, impeccably designed world premiere production at the Axis Company. The play is inspired by the book The Slave Ship: A Human History, by Markus Rediker. Things are going very badly on the Perisher, as the slave ship is named. The crew recently had to put down a revolt in which many of their number were injured or killed. Still more were felled by illness. Now the winds have completely ceased and they are dead in the water. Another ship is on the horizon, which might be good news if not for the fact that the Perisher’s voyage is technically illegal (in the early 19th century the slave trade, as distinct from the continued exploitation of people already enslaved, was banned in the US). Is that ship out there an interceptor, coming to arrest the crew and return the valuable cargo to Africa? The possibility requires the desperate men to come up with a plan to save their skins. There are multiple problems to consider: Am I going to prison? Am I going to get paid? How will this affect my career? And, oh yes, is this God’s retribution for trafficking in human beings? There are five people on deck and, we are told, 123 below—give or take a few who may have recently expired. We can’t see the men, women and children in chains, but we can hear them: talking, singing, banging, and praying (sound designer Steve Fontaine does meticulous work here). The anxiety produced by not seeing keeps us leaning forward in our seats as the sailors argue over whether to abandon ship and, if so, what happens to the people in the hold? Written and directed by Randy Sharp, The Vast Machine provides a fascinating look into an industry that changed the course and the nature of America and, indeed, the entire Western world. Each of its characters is distinct, wrestling with his own demons. The cast is a mixed bag, with performances ranging from excellent to downright odd (if entertaining); the standout is Julian Rozzell as the Perisher’s doctor, a no-nonsense fellow who just wants off this godforsaken ship and onto dry land as quickly as possible. Coincidentally, Rozell plays the sole black member of the crew; as complicated as everyone else’s psychology may be, his is on a whole other level. The Vast Machine’s most interesting element—the heavy presence of the unseen humans below deck—is also its potential Achilles heel. The irony of the fact that we are, once again, examining race slavery from the point of view of (mostly) white characters is hard to ignore. However, that very irony is what makes the play such an uncomfortable and therefore effective experience. A hundred and fifty years have passed since the Civil War ended and there’s still much work to do unraveling our brutal history. The Vast Machine won’t be the last play to contribute to that process, but it’s a worthy addition to the conversation.